The musings of a classical music and jazz antiquarian and appraiser with an emphasis on historical composers, musicians, opera singers and ballet dancers; with a good bit of opinion of the World of classical music and opera today and everything else including the kitchen sink. I hate to say, "told you so" but I will. You see, "butts in seats" is the lifeblood of any theatre, whether it be opera, musical, legitimate stage, or a concert. You can have any number of side shows, however, they will never make up the revenue gained by a filled house. These days﻿ I get regular reports from my subscription friends that one can roll a bowling ball down many of the aisles and not clip and ankle. That's a tragedy. You see, sports in New York City is only broadcast in the local area when the house is full. Sure they receive some revenue every time a game is shown on local elevision, but not the same revenue as the teams take in when the house is full and receiving broadcast payment. The iconic Yankees have been doing this for a long time and have experimented for years with the concept. If Gelb had paid attention to those who came before in the television medium, he would have learned the lesson without sacrificing a dime. By not doing research, he has transferred any number of reliable ticket buyers to the cheaper seats of the movie theatre. Sure, he clears out any number of NYC nursing homes on his weekend broadcasts to the theatre. I've put that one to the test and have gone to several transmissions at several theatres and truth be told, the handicapped section is rowdy, filled with wheelchairs with oxygen tanks. In that case he is performing a mitzvah and giving Seniors who would be otherwise bored playing bingo on a Saturday afternoon something extra-cirricular to do. But look at the able bodied in the house and see the revenue lost as many are real in-opera-house ticket buyers. It took Mr. Gelb 6 years, yes 6 years of watching an emptier and emptier theatre before he finally decided to lower ticket prices. They are paying him over $1.5 million per year and he's making mistakes of this magnitude. Another business example which he could have remedied with business school. (I learned this one in a business class in the 1980's.) Wal-Mart is the example. You see, Wal-Mart lowers their margins on certain items to bring customers into the store, customers like lower prices and go to them for the products they need. Gelb claims he wants to make the MET "less stuffy", that means ticket prices are no longer sacrosant. You see, it's better to lower your ticket prices to a reasonable point where you will make money and fill the house, rather than sitting on high priced tickets which do not sell. It's been an economic disaster over there. It also keeps you from going to "little old lady land" when you can pay your staff from money earned, rather than begging for donations. His next move should be to NYC off from HD movie house events and at the same time, also stop the transmission from movie theatres for a 50 mile radius; the same rule the Yankees employ before they agree to allow their team coverage on television. Sure if he could fill the theatre, then you run the HD transmissions, but if you can't fill your theatre and one of the real problems is your HD transmissions, you don't keep running them in a movie theatre steps away from your own theatre, or even within the confines of the island you call home. Keep in mind it is also really easy for folks from New Jersey, the Stanford/Greenwich part of Connecticut, or Philadelphia to stay home and pay substantially lower price tickets at the theatre and not brave the traffic. I challenge the Board of the Metropolitan Opera to get involved with what your director is doing. the financial future of the house is at stake and right now the reality is not pretty. Though the leadership of the Board at present inherited the money from her business saavy husband and the MET shakes her down for land grant donations every year, she does not appear to be marketing saavy, or she would have done something about this already. However, there are titans of industry on that board with real marketing experience who have not stepped up to the plate and said there is something seriously wrong here. Based upon the success of the HD program and the failure to bring clients into the House, it would seem the MET could rent a sound stage and just present HD opera. But that is not their mission. Their mission is to present opera in a theatre and to keep the theatre filled. Get involved, look over Mr. Gelb's shoulder. Remember, you hired a guy with no theatrical experience. 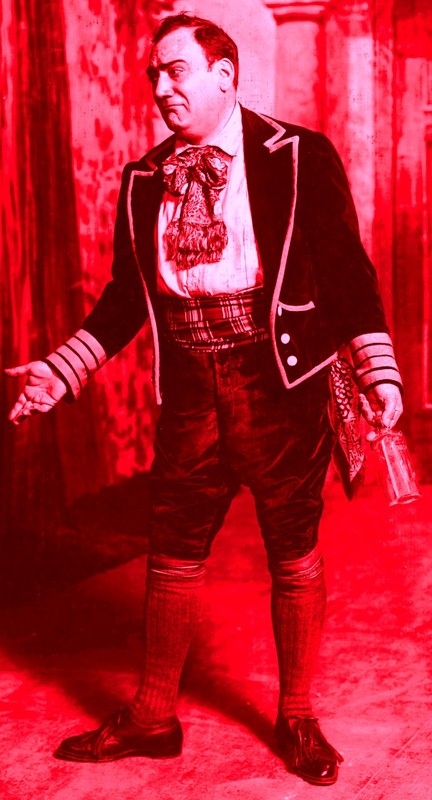 He had never run an opera house or a theatre in his life. You bought into his ideas, but did not second guess anything he did until he ran into trouble last year censoring blogs and attempting to silence Opera News. Mr. Gelb needs oversight, he has no MBA, nor does he have a bachelors degree. His previous work experience had nothing to do with the presentation of opera. Sure he has a success every now and then, but they are few and far between, as they say down South, "Even a blind squirrel will find an acorn now and then." By the way, I am your audience, I am in the business, I used to go to the MET on a weekly basis. 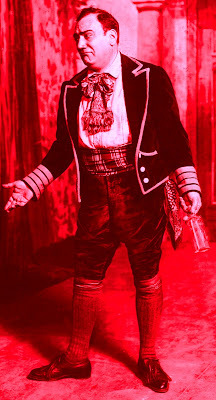 I know far more about opera than Peter Gelb will ever know and I will not pay one penny for a ticket, nor accept a ticket from anyone at present. I am also not alone. In June of 1986, I was living in Dallas, Texas, a year out of college. I had mentioned to a friend of mine who was well connected in Dallas that I might like to re-start my ambition to become a concert pianist after a hiatus of 6 or so years. He immediately had an idea, I should play for his dear friend Van Cliburn. Now that was mighty ambitious I thought, but with a ridiculous amount of encouragement from my friend, I started to prepare a few Chopin Waltzes for the occasion. A month later, it was July, the date of the appointment had arrived. You see, July is the hottest months in Dallas, one can literally fry an egg on the sidewalk. So I am standing nervously in my friends home, pieces prepared and conversely, his wife had prepared a spread in their living room. Up the driveway comes the limousine. The door is opened by the driver and out pops Van Cliburn's mother, his constant companion at the time, wearing a full length red sable coat and then out came the Maestro himself. They all went in the house, I nervously shook his hand in complete reverence and got the surprise of my life, a cold, clammy, dead fish handshake in return. 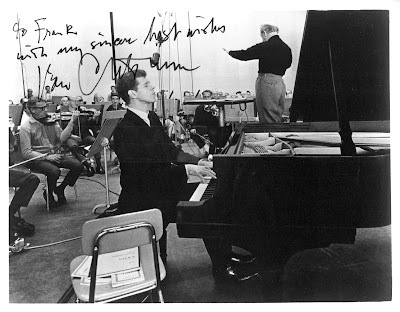 Oh well, I pressed on and played for Cliburn, he was very complimentary and recommended at professor at North Texas State University, which for those who do not know, was in Denton and quite a schlep; so nothing ever came of it. When Van Cliburn passed away last week; the first thought that came to mind was the memory of that cold, wet fishy handshake and his Mom in her full length fur in July. Rest in peace, Maestro. Gustav Mahler at the end of his Vienna tenure sat for a series of photographs in his office at the Hofoper. The series taken by the Austrian photographer Moriz Nähr in 1907, are among the most iconic photographs of the composer. To my knowledge there are 8 poses, several seated, several standing at various angles and were released during Mahler's lifetime. These photographs which were a favorite of the composer, but quite expensive at the time, were dedicated to only his closest circle and are rarely offered on the open market, either by auction, or by dealer. His widow Alma, was famously shown holding a large version of the photograph in a photograph of her taken in her later years. Your fiftieth birthday affords an occasion for me to tell you what I always want to keep on saying: in what high regard I hold you. and how I cannot help remembering, with much distress that in earlier days I so annoyed you by being at variance with you. I feel I was wrong to try to thrust my opinions on you instead of listening when you talked and letting myself be enriched by what is more important than opinions: the resonance of a great personality. He signs the letter, With affectionate veneration and devotion. Which brings us to the drama surrounding the missing, now found Mahler photograph. A well written article by Dan Wakin of the New York Times discusses the basic situation surrounding the lost, then found photograph and some of the intrigue which has unnecessarily followed. A little background I have discovered since making contact with the Schoenberg Family. Mr. Cliff Fraser appears to have located the photograph while rummaging through his nonagenarian Grandmother's basement. He claims to have found the photograph behind a boiler and further claims it was so dirty he almost threw it out. 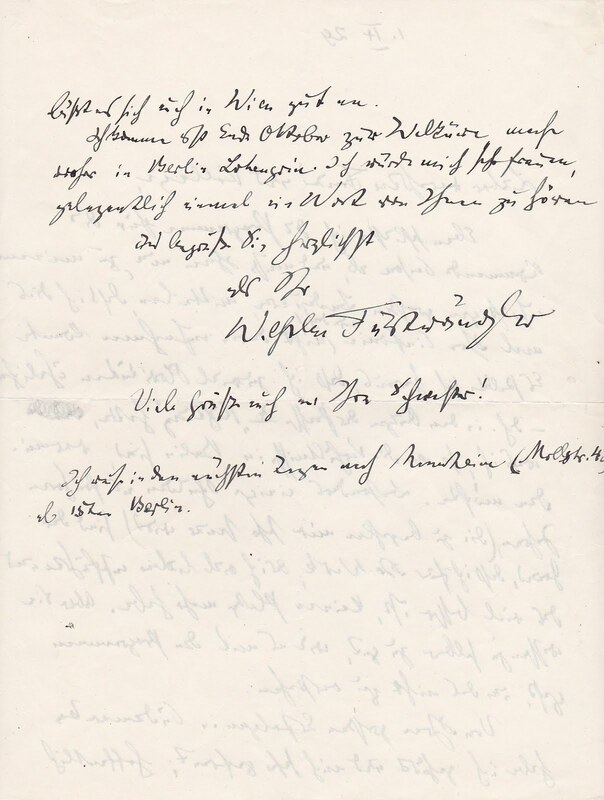 He apparently cleaned the item and then contacted the Schoenberg Center in Vienna, where the archivist, knowing the history around the photograph and about the empty frames they currently hold contacted the Schoenberg Family. Mr. Fraser maintains his Grandfather, Abraham Fraser, a pianist in the Los Angeles area was given the photograph by his teacher, Josef Schmidt, who was a pupil of Schoenberg's pupil Alban Berg. Berg died in 1935, when the photograph was well in the composer's possession. While several of Schmidt's students claim he was a pupil of Schoenberg, it is not the truth. 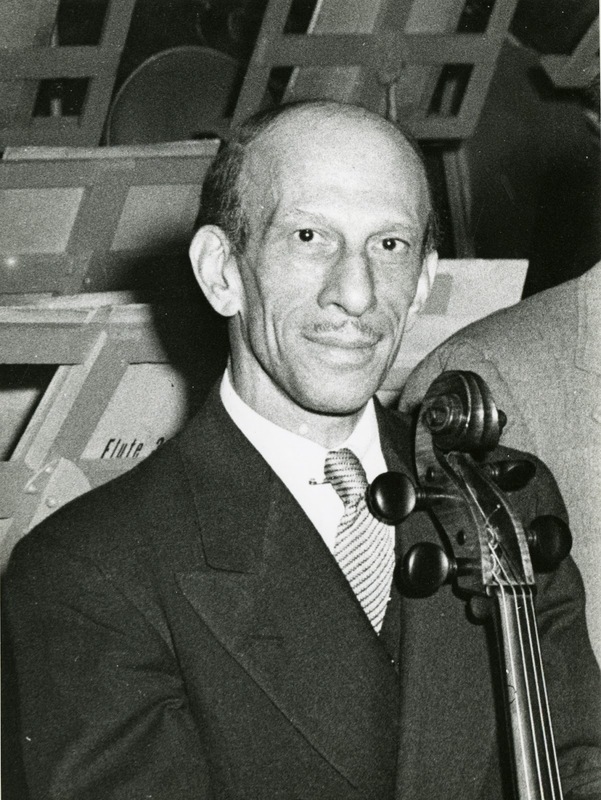 According to the Schoenberg family, who have examined all the evidence at their disposal, Schmidt was one of the many Jewish emigre musicians who were known to Schoenberg and occasionally visited his Los Angeles home. A dialogue began with the Schoenberg's and Mr. Fraser. Mr. Fraser looking for a big payday demanded they pay $350,000 to return the piece. They attempted to meet with him and he did not keep the appointment;then he then cut off communication with the family. At this point, Mr. Fraser decided to sell the piece on the open market offering it to dealers and auction houses. I come into the story a couple of months later as an interested party and attempted to make contact with Mr. Fraser. I had read about the item on Randol Schoenberg's blog and had further conversations with one of my colleagues whom Mr. Fraser had contacted. The entire situation was quite intriguing and so as a known dealer in the marketplace, I made contact. I was told that you have a group of autographs in the classical music field that you wish to sell. I would be interested in hearing about what you might have to offer. How exactly did you hear of me and who gave you my contact information? From another dealer whom you contacted who was not interested in whatever you offered to them, but thought I might have an interest. 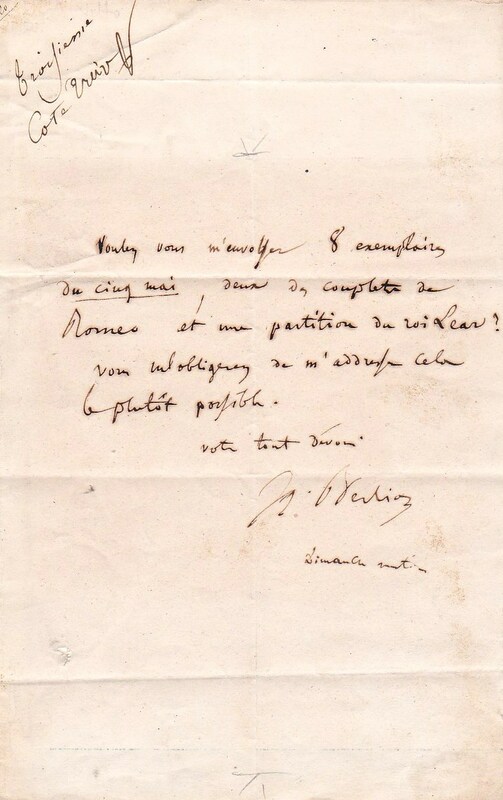 We buy and sell classical music autographs, manuscripts, scores, letters and ephemera. I am a long standing dealer in the field and a member of the Professional Autograph Dealers Association. Anyhow, happy to discuss anything you might have to offer. If you no longer have any items, sorry to trouble you. 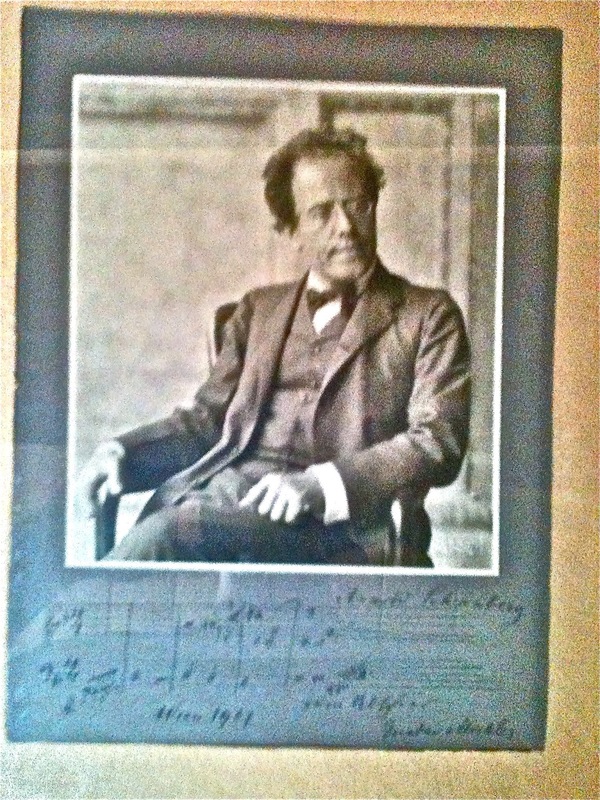 I have an autographed and inscribed photograph of Gustav Mahler, dedicated to Arnold Schoenberg. The document's description is as follows: The photograph is a gelatin silver print, measuring approximately 6 inches by 6 ½ inches, mounted on strong cardboard, measuring 8 ½ inches by 10 ¾ inches. The photograph is set off-centered, leaving an uncovered space measuring 2 ½ inches, between the bottom edge of the photograph and the bottom edge of the cardboard. Furthermore, in this aforementioned space there is a penned inscription. The print is a portrayal of Gustav Mahler in the foyer of the Vienna Court Opera, commissioned in 1907. The artist was Moritz Nahr, and the print bears his stamp which is imprinted in the bottom right-hand corner. The stamp reads, “M Nahr Wien 07”. 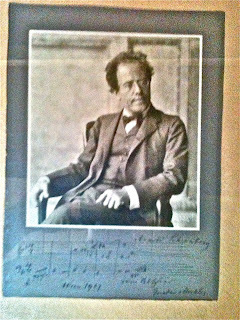 In the print, Gustav Mahler sits in a chair, left leg crossing over right, arms resting at his sides, right had clutching the chair, left hand forming a fist, head turned to the left. Mahler is wearing glasses, collared shirt, bow-tie, button-up vest, single-breasted jacket, and pants; his feet are not visible. The inscription, which is written in the uncovered space on the cardboard mount below the photograph, is penned in black ink. 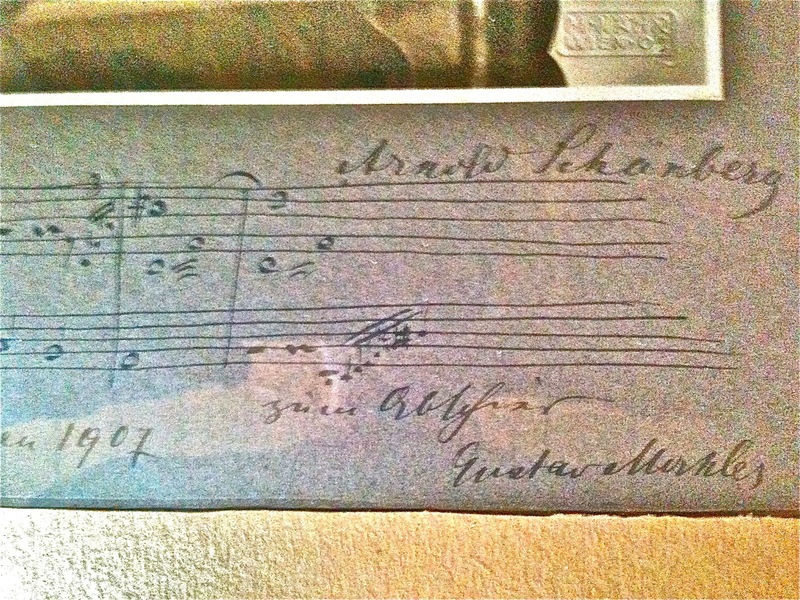 The inscription reads as follows: “Arnold Schoenberg”, followed by hand written music, “zum abschied, Wien 1907, Gustav Mahler”. 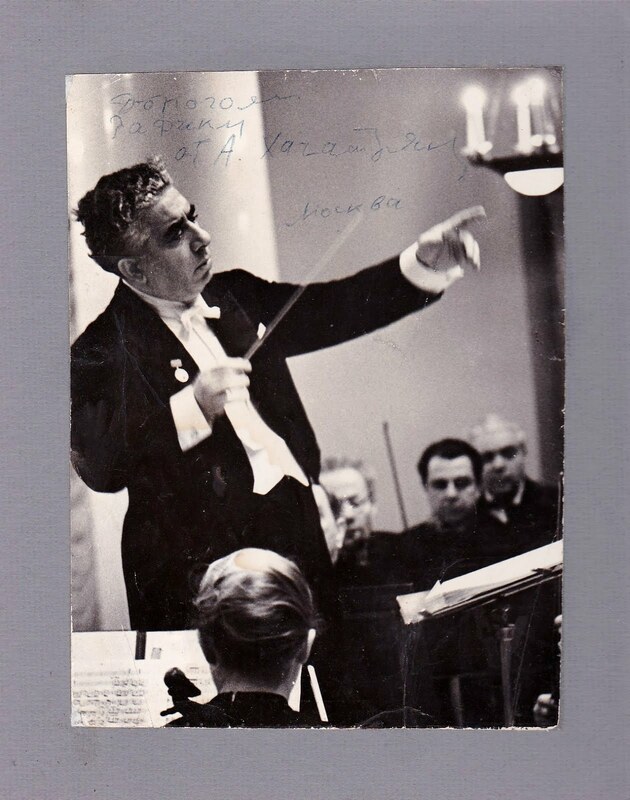 Considering Sotheby's recent sale of Mahler's last symphony manuscript for approximately $600,000.00, I value the photograph at least $500,000.00, however, I am negotiable. Now, the reply above was in a patchwork of fonts. Also the response as you can see is not written by someone who recently found an item in an area he knew nothing about. The language is quite interesting, as it is not autograph dealer speak, but antiquarian book seller colloquialisms. Further, the writing even there is inconsistent and appears to be cobbled together from several people's writing. The email was accompanied by the photograph you see above and several grainy close-ups of the autograph, attached, please see one of the additional images below. Looking at this situation from my position as a Music Antiquarian, this photograph would normally be something worthy of acquiring. I could even think of several logical buyers, but there is history on the sale of this image signed and unsigned in the marketplace and the price he was asking was absurd and had no basis in reality. His basis of comparison, the manuscript for Mahler's 10th Symphony versus an autographed photograph dedicated to Arnold Schoenberg was ludicrous at best and not a basis of comparison whatsoever. An unsigned original standing version of the photograph was sold Villa Grisebach Auktionen in Berlin at a photography auction in 2002 for $7700 U.S. One was offered on E-Bay in 2006 of the same image, also unsigned and brought slightly more than $2000 U.S. 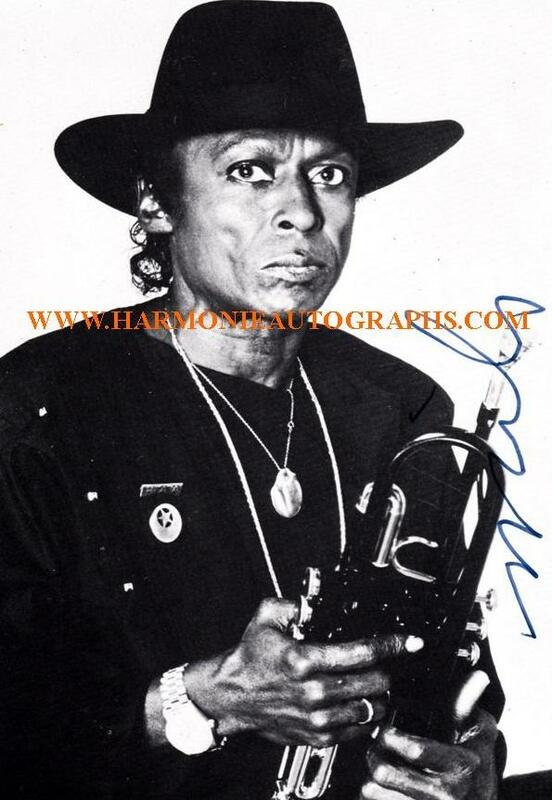 I have had the photograph myself signed and inscribed without bars of music and sold it for $15,000. A colleague of mine offered an autographed example with bars of music in his Christmas catalog four years ago and asked $25,000. The fact that the item is signed to Schoenberg would surely drive up the value, perhaps double, even as much as $65,000 on a really good day at auction, but no where near where this fellow was asking. Thanks for telling me about this piece. There is a huge difference between a manuscript and a signed photograph. You are talking about a Rolls Royce vs. a lower end BMW in a price comparison. Price wise, even with an amazing dedication like this, it still is only worth a fraction of an important manuscript of one of the composer's most important works. I have sold this same image signed to a musician within the last 5 years and the retail price was $15,000.00. I have also appraised at least two others in the same period with similar dedications one to a friend, the other a musician and arrived at the same price. That price actually jibes with the entire dealer community. Now obviously, a photograph signed to Schoenberg would command a higher retail, but the question is how much higher. In my mind, at auction the piece would not reach more than $50-$65,000 on a good day, which means I would have to be at close to half of whatever price we agreed upon. Where in the World did you wind up with this amazing piece? Also, I heard you had other items which may be of interest. Anyhow, is there a way to get a clearer scan of the photograph? Thank you for your professional opinion. However, after speaking with my attorney, I can not continue this discussion unless you identify the individual who gave you my personal information. I have dealt with very few in regard to this item and some have been of unscrupulous character. As a representative of the PADA, a promoter of ethical business practice, I am sure you understand. No, frankly I did not understand. The fact he had engaged an attorney threw up all sorts of alarm bells, something did not smell right. I had provided serious knowledge which could be easily followed up on the internet and it would seem he was unwilling to follow through on the provenance. But truly intrigued, I followed up the conversation. The piece you offered to me was priced in the stratosphere, many times above the market price. You arrived a price based on a Sotheby's comparable that is a disconnect and it will not sell to a dealer, private collector, or institution anywhere in the World. I've been in this field for many years both as a collector first and then a dealer and appraiser. Two and two do not equal four. I was making you aware that your desired price is unattainable, at Sotheby's, or any place else. Your chances of selling it at your desired price is unachievable. Many in your shoes have an inflated idea of what their property is worth. It is not uncommon, however, if you truly wish to sell the piece, I am happy to work with you at a price that is achievable in the market. It would be in my best interest to sell it at the highest price one could expect from a piece like this, but Five hundred thousand, or even a close percentage of that is not where the market is on the item you have. In speaking with my colleague, he told me he advised you the price was much too high. Now all of these e-mails occurred over the space of approximately 24 hours and wouldn't you know, all of a sudden the next e-mail came and he has dropped the price from $500,000 to $100,000. Which while substantially lower was not a realistic price. Under no circumstance would I consign my piece. The only way I would continue dealing with you is if I receive an offer of no less than $100,000. Obviously the information you received is inaccurate on numerous fronts. So I decided to continue with the conversation as I would for any item I planned to purchase for my inventory, or as an agent for one of my clients. This time I asked for a high resolution scan of the item to see the condition of the piece as well as once again requesting the provenance, a question he he had not answered in one of my earlier e-mails. $100,000 is a more realistic gross price, still ad tad high; but where it could be sent to several key collectors for an impression and a possibly a bite, or even if we get lucky, as sale. If I we were to act as your agent, we would need a detailed scan 150 dpi jpg minimum, 300 dpi preferred of the item out of the frame, both sides of the piece. Most of the collectors at this level are extremely concerned about condition and the scans you forwarded will not work. I also need to be able to discuss minute details like creases, tears etc. on the item with as much knowledge as possible. Collectors could care less about the frame and would want to take it to an archival framer and have it matted and molded to their liking, or have a custom leather binder made for the item. It is also important to insure that the piece they are buying has a good clean provenance as I discussed in my earlier e-mail, I need to be able to tell the client where the item has been since Arnold Schoenberg passed away. Obviously if we were to move forward and we do have a bite, I would have to fly out to wherever you are to see the item in person, that is unless you have any designs on coming into New York City. If you would like to move forward, you now know what I need. If we get to the point that something positive happens, I will send you our standard written agreement and we can work from there. A reply came, however, he would not forward a scan to me unless I sent him a check in advance and he still did not answer the question about provenance. As explained previously, I am not interested in an agent as I have great interest internationally and have representation. If you wish to make a definitive offer of $100,000 to purchase the piece directly, I will be happy to comply with your request for a detailed scan. Respectfully, if we can not proceed as I have outlined there is no reason to think we can move forward. Your company or personal check will be acceptable. Now, it was very apparent something was truly amiss. The expectation a buyer would forward a check of this size to a seller without seeing the piece was a ridiculous request. What buyer for any item, would make an definitive offer to buy anything for $100,000 without kicking the tires. Had there been legitimacy to this dance, the buyer would have forwarded scans for my examination so I could decide whether it was worth the price and go to pick the item up in person, negotiate more, or back out. Further, an unimpeachable provenance with a clear lineage would need to be ascertained. I would have to know I was purchasing an item that was legitimately his to sell and mine to own and resell. So I followed up with what I thought would be the final bit of correspondence and I was not wrong. I cannot commit this sort of money to a piece I have not seen. I cannot move forward with you unless I have seen a scan showing the piece in enough detail that I see any and all imperfections. The value of the piece is based upon perfection, tears, worn edges, sun fades, foxing, creases etc. have to be taken into consideration and your current digital photographs do not show detail at that level, they are fuzzy and pixelated. I have to be able to resell the item to one of my clients and I have to be able to know these things before I can make any sort of commitment. Further, after seeing the scans, if all looks well, I would have to expend capital to come out to wherever you are to see the item in person. Think about it, I'll assume you are a logical guy, would you commit to buy anything significant expending a large amount of capital if you had not seen the item? We are in a recession and I need to feel confident I could sell the item to one of my clients promptly. Secondly, I need to understand how you came by a piece of this significance. Are you a member of the Schoenberg family? I have asked you several times for the information and you have avoided providing the provenance. If I were to spend a significant amount on this piece, I have to do my due diligence on the piece as well, to insure I am handling something that would legally be mine. Any dealer of upstanding character has to do this. That was the end of the conversation. I sent a follow up a few days later and asked him if their was a reply forthcoming to my questions, as expected, no reply. 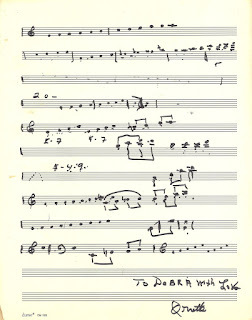 A very detailed account of the piece and the Schoenberg Family's attempt to discuss the piece and meet with Mr. Fraser can be found on the composer's Grandson, Randol Schoenberg's blog. Now in my role as a known dealer and appraiser of such items, I hear all sorts of stories. I have dealt with families who don't speak, where one side has knowledge and the other does not. I have dealt with pieces which were gifted by a composer, or a musician to a favorite disciple. I have dealt with marital disputes and yes as a dealer I have been offered items which I knew did not belong in the hands of the person offering them to me. I remember a dumpster diver who came up with some important letters of a very famous composer. The mistress who had not been in contact with her family had been sent to a nursing home and had not paid her rent. Her landlord dumped the entire contents onto the street and I purchased the items and repatriated them with a family member of the composer who manages his archive. I even purchased an item once from an overseas dealer I suspected of selling stolen property to see the library markings on the item first hand and determine if the items had been stolen. He was arrested shortly thereafter and the story made the New York Times. I called Randol Schoenberg today to see if there had been any communication from Mr. Fraser. I decided to publish this article and expose what is really going on behind the scenes in this particular situation, a portion of the story the New York Times article could not tell. Changing to Op-Ed mode, the intrigue surrounding this story smells of greed. 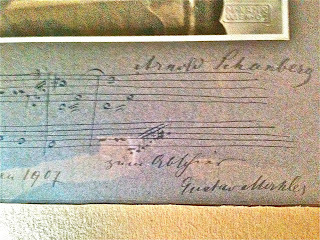 The Schoenberg family established and have long since given the Maestro's estate to the Schoenberg Center in Vienna. The piece obviously belongs to them and they will surely send it there to be united with the composer's other possessions. To the best of my knowledge, there is no statute of limitations on stolen property anywhere in the Country. As a casual acquaintance, there is no probability the composer would have given this prize possession to Joseph Schmidt. The family knew the piece was there after the death of Schoenberg and his widow Gertrud would not have given her husband's prize souvenir of his relationship with Mahler to a man who had a cursory relationship with the family. Further Mr. Schmidt lived in New York during the time between the composer and his widows death. Dan Wakin published a statement by Mr. Fraser's Father that he had never seen the photograph before. I know music autograph collectors. They are very proud of their holdings and prominently display their most important pieces and love discussing them with anyone who might take an interest. Surely, a Father would have shared something of this importance with his son growing up. If Mr. Fraser's Grandfather did not display this piece in his home, or studio, the hiding of the photograph speaks louder than words. There is a reason it was found coated with dust behind a boiler in the basement. Mr. Fraser's Father went on to say that if he could, he would return the piece to the Schoenberg's. It is now up to Mr. Fraser to do the right thing and give the photograph back to the Schoenberg Family, so it can be placed in the Schoenberg Center for the World to see. The Return of the Opportunity to be a Back Yard Impresario! Well he's not done with auctions yet, BVA Auctions in Hoevelaken in the Netherlands has all the items now broken up in 1600 lots to be sold in two days time, on 9/27. Here is the listings on their website. Link here 1, Link here 2, Link here 3. 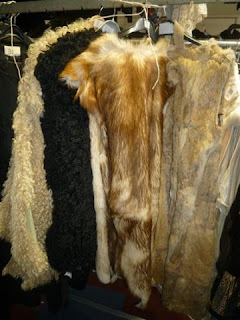 One can still be one's own back yard impresario, each lot begins at a single Euro! The Liszt Sonata in B minor performed from the manuscript! 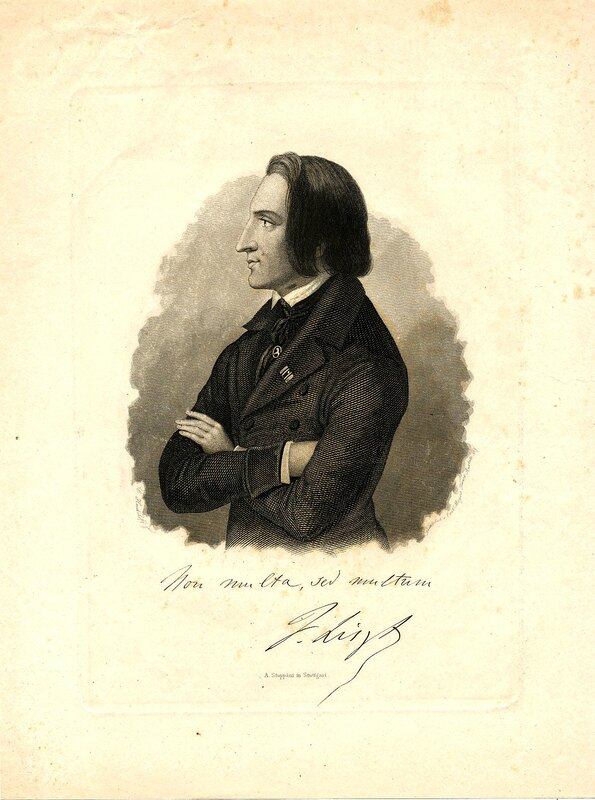 I was recently made aware of a YouTube video by our friend pianist Professor Claudius Tanski of the Salzburg, Mozarteum performing the devilishly difficult Liszt Sonata in B minor S. 178 from the original manuscript! 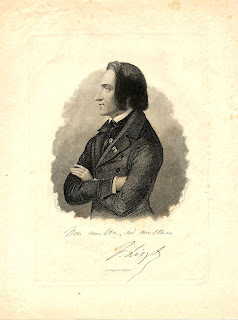 The piece is hard enough to master from the printed music, let alone performed in Liszt's at times difficult handwriting! 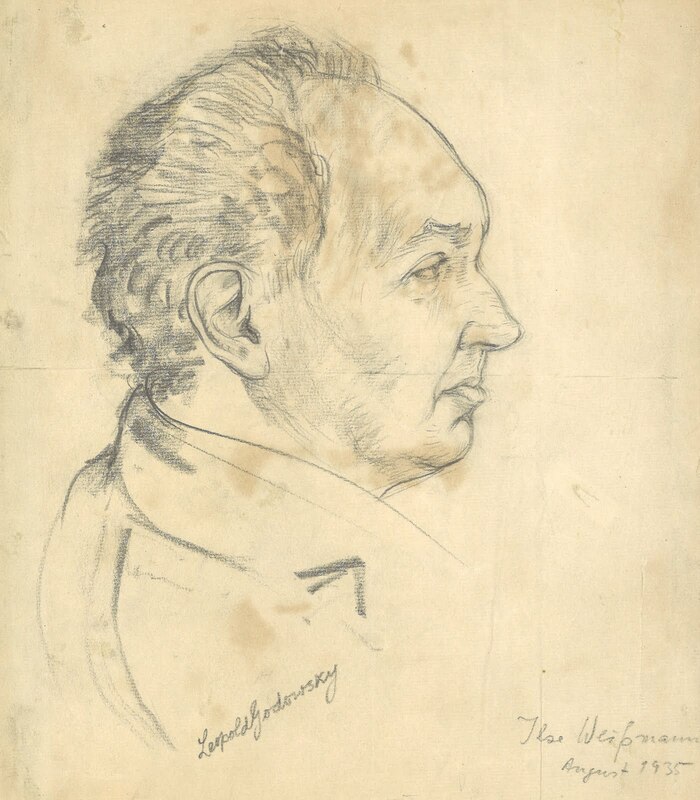 By utilizing the manuscript, Professor Tanski is able to bring the piece, a revolutionary work in its' time to life with all of the original warts and without publisher oversight contained in the more harmonized published version! I recommend a careful listen to this performance, which is quite unique in comparison to anything I have ever heard before. A free reading, elegant in phrasing and containing all of the slight nuances written by the composer in it's original form. The manuscript is contained in the Lehman collection, currently housed at the Morgan Library here in New York City. If You Like Mahler's 1st, An Unusual Recording You Should buy! Every once in a blue moon, I'll take a risk on a recording that could possibly hit the trash can after a first listen. I happened to stop by the Juilliard Store yesterday while my computer was in the repair shop. As I rounded the last CD section, I saw they were running a $9.98 sale on single disk Urania recordings. 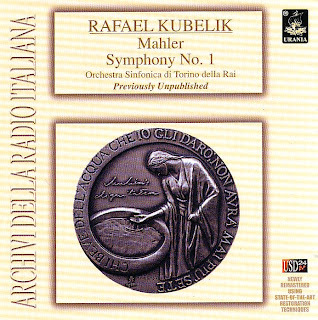 Knowing Urania can be a real mixed bag when it comes to sound quality, I looked over the group of cd's and saw this oddball Mahler's 1st with Rafael Kubelik conducting the Orchestra Sinfonica di Torino della Rai in a live radio broadcast from Turin in 1956. So, being a sucker for Mahler's 1st I thought, what the hell, $9.98, what do I have to lose? I told my friend Seth Winner, a noted Sound Engineer about my new purchase and he chuckled. Though he had to admit he never heard the recording before. Anyhow, Urania released this recording from the original master tapes in 2005, the first time the performance had been published in any form. Wow!!!! is the best descriptor for this recording. A true tribute to Kubelik, as it is completely obvious he spent the time needed to take the Italian out of the orchestra and focus on Mahler's dynamics. The brass as one would expect from an Italian orchestra is strong, but note overdone as I have heard in any number of recordings of the period, the strings are glorious, but the most surprising aspect is the clarity of the woodwinds. The engineer who strung the microphones knew the hall, but also knew the piece, as the woodwinds are well emphasized and the detail in the first and third movements is something to behold and something which engineers do not always emphasize. On the weak end of the engineering is the underplay of the percussion and over-emphasis of what becomes a virtual tuba solo in the rounds of Frere Jacques at the beginning of the movement. Happily, the orchestra also has a real feel for the Klezmer vs. Funeral dynamic in the same movement. The transfer engineers do a terrific job as well and I can heartily recommend this recording for overall sound quality. Interestingly Kubelik takes the 4th movement in a very deliberate way. Mahler's marking of Stürmisch bewegt – Energisch (Stormy and Energetic) are built upon, rather than raging from the moment the movement begins. I personally like this aspect of the performance very much, but it may not be to the absolute puritans liking. I am quite reminded of the deliberate conducting of Hans Knappertsbusch's in his Westminster recording of Fidelio when I hear something like this which is in absolute good taste, but not quite the way others envision it. Anyhow, I am sure this cd is available from a variety of sources, however, the sale makes this all worthwhile. You can call the Juilliard Store at 212-799-5000, or contact them via their website, Juilliard Store contact page to take advantage of this particular cd. The Music Antiquarian Blog, Harmonie Autographs and Music, Inc. and their employees have not received any financial compensation in the publication of this article. Each piece was recorded privately by the cellist during a professional recording session. We own the original source and copyright on the proprietary engineered sound files. 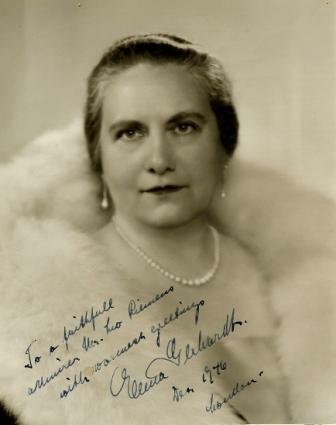 Elena Gerhardt sings Brahms great lied "Von Ewiger Liebe"
Elena Gerhardt may not be a name well recognized today except by record collectors. However, at one point in time, she was the most beloved concert mezzo-soprano on the concert stage. Her lieder concerts were an event that were awaited with great anticipation on three continents. She was trained at the Leipzig Conservatory, where the legendary conductor Artur Nikisch took her under his wing and promoted her career from the very start, even accompanying her in her debut recital. Some of her most collected records have the conductor at the piano. What is not well know about Gerhardt is that she had a Jewish husband who was in charge of the radio network system in Germany. In 1933 he was dismissed by the Nazi's and brought up on trumped up charges. Gerhardt who had left for England with the understanding her husband would soon follow, had to go back to Germany which was a very dangerous thing to do for a spouse married to a Jewish suspect in a criminal case. She pleaded and was able to obtain his release for England only after the Nazi's had finished prosecuting him. Gerhardt had a flourishing career in England and once the War was over, the United States and the rest of the World. This 1925 early electric recording is a true document of vocal history. My sound engineer worked wonders on this very difficult record. There are a few over-modulation points when she takes the higher register, however, that is the fault of the early microphone and not her own. Enjoy! 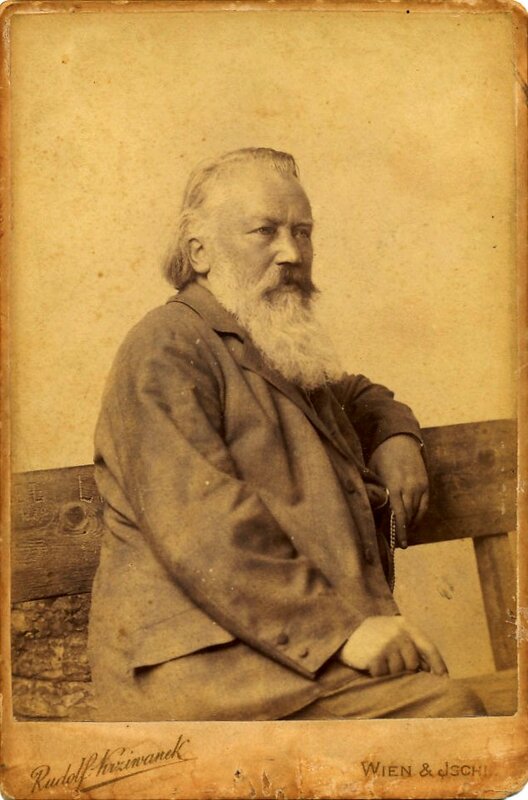 The legendary pianist once described the Johannes Brahms he knew very succinctly. He broke the composer down into the three "B's, Beard, Beer and Belly. Page 268 of Stuart Isacoff's A Natural History of the Piano. We appraise, buy and sell music antiquities, autographs, first edition scores, photographs, books, letters etc. etc. of famous classical musicians, composers, conductors, opera singers and big band jazz musicians. We are well known in the professional music field for our appraisal of composer, musician and professional organizations archives. Copyright Harmonie Autographs and Music, Inc. 2018. Simple theme. Powered by Blogger.